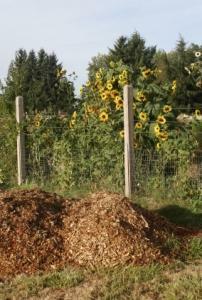 You can use a mulch calculator or do the math yourself to figure out how much mulch to spread in the garden. Many websites offer a free mulch calculator. It's also easy to do a few simple multiplication and division steps to figure out how much mulch you need. Knowing the manual way to calculate mulch helps a lot when you're standing in the garden center trying to figure out how much to buy. Before visiting a mulch calculator, you'll need to know a few things about the area where you want to spread mulch. Using a tape measure, measure the length and width of the area where you need to spread the mulch. You can round it up to the nearest inch. You will also need to know the depth to which you want to spread the mulch. When you input these numbers into a mulch calculator, the numerical answer is the number of cubic feet of mulch you will need to cover the area at the depth indicated. The following online calculators make it simple to sit at the computer and get the number of cubic feet of mulch you need. Lowe's mulch calculator is straightforward and easy to use. Just type in the numbers of the length, width and depth, press the button, and you have the number of square feet. Home and Garden Show Place offers a different calculator. This one not only gives you the number of cubic feet that you'll need, it also tells you how many bags of mulch to buy. For the mathematically challenged who find it hard to figure out how many bags of soil or mulch to buy, this calculator comes in handy. It also has a drop down menu offering choices of mulch depth less than an inch. This lets you pick half, quarter and eighth of an inch thickness without having to convert fractions to decimals. It takes most of the math out of the process as well as the guess work. Steck's Nursery offers an online calculator for the entire garden. You simply input the numbers from each of the garden areas you need to cover, and their calculator comes up with the totals as well as the amount needed for each garden bed. This saves you the time and trouble of having to input each garden area's numbers, calculate, write down the answer and repeat. You can calculate the entire garden and print off the page to take with you to the store. The National Gardening Association's mulch calculator makes you do little bit of math. First, you have to calculate the square feet. Multiply the length times the width of the garden bed to get the total number of square feet to cover. Type the answer into their box, and click the thickness from the drop down menu to get the result. If you don't have access to a computer, a mulch calculator doesn't do much good. You can easily figure out how much mulch to buy using this manual calculation method. Take the measurements of the garden bed in feet. You will need the length and width of the area to cover. Multiply the length and the width. How many inches of mulch do you need? Multiply the depth times the answer in the step above. Divide the answer in step 3 by 12. You now have the number of cubic feet of mulch you need. Divide 40 by 12 = 3.3 cubic feet of mulch needed. If that's too much math for you, go back to the handy online mulch calculators. They make it easy to make up your shopping list before you head to the garden center. Spreading mulch in the garden helps in so many ways. Mulch consists of plant material such as pine bark, cocoa hulls or wood chips or other materials such as rubber. When spread over the top of the soil, mulch suppresses weeds, helps the soil retain moisture, and shades the roots of plants. Bark, chips and cocoa hull mulch also breaks down or decomposes over time, adding nutrients to the soil.